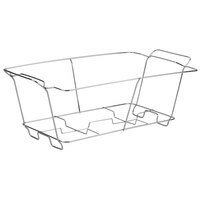 For a convenient, stylish, and economic serving option, try this Choice chrome wire chafer stand for full size disposable pans at your next event! This chafer stand is an inexpensive alternative to traditional chafers. It can be disposed of after use, saving you labor costs, precious storage space, and time as you don't have to worry about washing and caring for your chafer. And just because it's convenient, doesn't mean it can't be attractive! This stand features a versatile chrome colors that will shine atop your buffet or serving station and offer you unmatched versatility. Sturdier than I expected, and can be reused again. We often order food trays that already come in a pan, so this makes it easy for us to heat the food up and keep it warm esp for a big group gathering. These racks are perfect, we rarely rent out our expensive racks anymore, it's always been a hassle, now we just sell them these and tell them to keep it. Although it is constructed nicely, I am in agreement with other reviews regarding the sternos. It was too close to to the pan and it caused a burning. Durable, easy to clean, and doesn't look cheap. They also always have these in stock which my other provider had issues with. They are also easy to clean. This chafing dish stand worked well. We used it for a rehearsal dinner, keeping thai food (mostly tofu curry) warm over a couple hour period. The food was kept warm without any problems....it was lightweight, but didn't bend or become mis-shaped during the chaos of picking food up. The stands are by far the best I’ve used. Not all stands are created equal. They must be durable and light. Not to mention the price. This is absolutely the lowest price you’ll find them anywhere. They fit your standard sterno and full pan, and can be used over and over. Our normal supplier was on a storage so we tried these and they are great. More sturdy and less expensive than what we were buying! win win! These chafer stands are essential if you are setting up a catering spread that needs to stay hot for hours. The stands can accommodate one or two fuel canisters. The chafer fuel was way too close to the bottom of the pans. It was burning through the pan. If you can't keep the food warm it defeats the purpose. These chafer stands are a great deal, about half of the price I was paying previously from our supplier. They are of good sturdy quality and we haven't had any complaints from our customers - I am ordering them in by the case! While preparing for my event, my menu started growing, so I needed more chafer stands. I was glad to find these. They arrived in perfect condition and I love the chrome finish! Used to hold aluminum pans on the steam table for an event. The stands were actually more sturdy than expected and were able to hold fairly heavy pans. Would purchase again. The price of these are perfect and are a great buy. They are very durable for the price and will be purchased again in the future. These chafer stands are pretty sturdy, definitely not disposable as listed. I reuse these time and time again. As a caterer I can leave them with my regular customers and not have to retrieve them because of the awesome price point. This wire stand securely holds true for pans for banquets or Potlucks. Nice chrome finish makes this a quality stand that can be used again and again. These were perfect for our cook out. They were the perfect size for two half pans (one full pan). They are sturdy enough to get multiple uses out of or cheap enough if you never get them back. I will definitely buy more the next time we need them. This chrome plated wire chafer stand is perfect for banquets or receptions. Holds your food pan securely on top of your wick fuel to keep your food warm for hours. Nice quality stand for the price. I love the chrome wire Chafer stand. I know that they are disposable but they can still be used again. Heavy weight and not flimsy. I stumbled upon Webstaurant when I did a google search for disposable chafer stands, which I needed for a recent party. Bingo!! What a find!! These stands are sturdy and by no means are they disposable. They will be used again and again until they cannot be used anymore, whenever that is. There was no warping, they held the deep full-sized aluminum pans well, then inside of that pan was the medium depth pans for food, and plenty of it. The fuel holders at the bottom, though simple, worked just find. I am still in awe at the price. Great, great product as an alternative to the more expensive warmers/chafers. These chrome wire chafer stands are sturdy and have nice sterno holders below. They are easy to transport and can stack which is very convenient! This was exactly what I was looking for! I am doing a DIY buffet for my upcoming October wedding and I will be able to drop some XL pans of pasta or whatever into these stands, put a chafing can under, and move about my day! They are sturdy, a good price, and I plan on keeping them around to use for other events down the road. 4 stars for price and shipping availability is pretty good. The issue we have had is if you use the disposable pans, the sides bend a little too much to hold slightly heavier foods over the steam pans, nothing tragic, just not as sturdy as other brands. This wire stand is very sturdy and works well when dropping off catering items. We are able to have a presentable set up and leave these items with the customers. This wire chafer is of good quality and very strong. I had a full size steam pan on it for hours while heating food. The price is reasonable. I will recommend buying. Thank you. This is a great product for disposable drop offs. It is fairly sturdy and can be reused if you would like, just wipe them down and save for another use. Highly recommended. Great for one full size pan or 2 half size pans. Very sturdy and long lasting and able to be tossed around and stand up to grind. Impressive. If you think the price is an indication of quality your wrong. These racks are very sturdy, and are perfect for casual catered events, will be buying more. Great product for the price and very easy to set up. I also ordered the full and half size pans along with the heating fuels. The stands were also sturdy enough to hold the food in the pans. Definitely will use again. THANK YOU SO MUCH!!!! I RECEIVED MY ORDER IN A TIMELY FASHION AND WAS PACKED PROFESSIONALLY. I WILL BE ORDERING FROM HERE AGAIN. SHOPPING RIGHT NOW..
Used these at a graduation party to keep several foods warm. They were very strong as it held large and heavy pans of lasagna. Though they say they are disposable I will reuse. They don't get dirty and are a nice color. These are perfect for a quick set up, and easy enough, and cheap enough to just through away. They are very study and can hold the full pans with ease. I have these in use in a food truck. The description says disposable. I think that they mean that if you forgot it at an event then don't sweat it. I love the price! The size was standard and true to size. Even though it is disposable, I will reuse these chafer stands again. This a very sturdy product. Great product for the price. They hold up well and we can use them over and over again for full service catering orders as well as sampling at shows. A pretty standard wire rack. I wish it had more support in the middle, however. We had to double up all of our chafing dishes. After look for these Disposable Chafer stand finally I found it her an excellent price. Delivery time incredible. very well packaged. Not any damage. Strong material. We will have them for sure for a couple of events. They were 100% perfect. I have used them several times and they are still just as sturdy as ever. I will be ordering more soon . The Chrome Wire Chafer Stand for Full Size Disposable Pans has made serving easier for our customers at their events. Great for our large to go orders! This chafer stand is durable and functional. Since it is disposable, it works great when we have offsite caterings...no need to worry about getting our equipment returned to us. Very sturdy chrome wire chafer stand. Easy to stack when not it use and made everything easy to access on raised stand. The size was perfect for the food in full size disposable pans. These wire chafer stands work great when you need to keep food hot and do not have access to a power source. I would highly recommend! I have to rate this one as a 5 star, although admittedly, we haven't used it yet. I fully expect it to work great for us as everything we get from webstaurant usually does. Very good price for this product. I was very impressed as to how sturdy they are for the price that I paid for them. Other similiar ones I found were not so sturdy and cost more. This was made thicker then I expected. It is reusable and will last. Very Happy with this and will buy more of them. Great for Events, Camping, and Power outages. Uses 2 Cans of Oil for even heating. We do a large amount of catering at our BBQ business. We use these pans ALL the time! For the money they are the best we have found. Very durable and they look nice at our events. Looked everywhere for these chafer stands and they were so expensive everywhere. These were exactly what I needed for our event and came at at a great price. Cheap and effective. We used these for a one-time event - the price is fine for that! Still, they could definitely be reused multiple times. Was a drop nervous about the stability of the fuel cans, but turned out just fine. The design is more functional than beautiful, but not too obtrusive. These are great stands for setting up a chafer on the go! Easy to keep hotel pans of food hot for hours without having to transport large and heavy units!! Bought 6 of these a year ago and 5 are still working and in great shape. Not a great fit with anything over the 4" hotel pan. For the price...can't be beat.